It’s that time again! Time for another Wednesday Challenge. This week, take a couple of minutes each hour, 10am-5pm, and take a short walk. 200 steps each hour is the goal, but you don’t have to be exact. A two minute walk should get you there. Take a short break from your desk and do a lap or two around the office, or step outside for some fresh air. Staring at a computer screen all day can be draining. Taking short breaks to stretch your legs and your brain, can refresh and rejuvenate you, making you more alert and productive. Enjoy the short breather! As always, check in with us through our Twitter hashtag #THDWednesdayChallenge to let us know how you are doing. Zee (@zeethd) and Suze (@suzethd) will be there! And you can join us on Facebook too! Are you ready for another challenge? This week the challenge is to compliment yourself. Every hour from 10am to 5pm, find a mirror, look yourself in the eye, and give yourself a compliment. The compliment can be anything. The point is to remind yourself how amazing you are and to break the negative thinking cycle so many of us are guilty of. Don’t know what to say about yourself? What accomplishments have you achieved lately? They can be big (reached a goal, completed a project) or small (made it into work on time when you are usually late, got yourself out of bed for a workout when you usually hit snooze). What have others complimented you on or thanked you for in the past month? What’s your favorite physical feature? What are your virtues? This is personal, so you don’t have to tell us what you are saying to yourself. But we would like to hear how the challenge is going for you, so remember to check in with us through our Twitter hashtag #THDWednesdayChallenge. Zee (@zeethd) and Suze (@suzethd) will be around if you need ideas. Maybe we’ll even share some of our compliments so you can steal them for yourself! And you can join us on Facebook too! It’s time for Wednesday’s Challenge again! This week, we are focusing on refreshing, thirst quenching water! The challenge is to drink 1 cup (8 oz) of water each hour, starting at 10am and ending at 5pm. You don’t have to chug the glass at the top of the hour, unless you want to. Just make sure 8 oz is down the hatch by the next hour. Not a fan of water? Try adding lemon, cucumber, raspberries, watermelon or strawberries to your water. You can add as you go or fill a container with water the night before, drop in your choice of additive, and let the flavor infuse the water overnight. You can also add some herbs. Mint goes well with watermelon, strawberry, or cucumber. Basil also goes well with cucumber or strawberry. Or use your imagination and come up with some other fruit, vegetable, and herb matchups. Just make sure to share the recipe if it’s really good! Remember to use the Twitter hashtag #THDWednesdayChallenge to let us know how you are doing! Zee (@zeethd) and Suze (@suzethd) will be drinking with you! And you can join us on Facebook too! Hello! Remember us? We know we’ve been gone for a long time. Life got in the way. And admittedly, when you aren’t doing that great at sticking to your food tracking and exercise goals, it’s really tough to write about all of it. But we’re back! And we are both working at getting back on track and staying there. 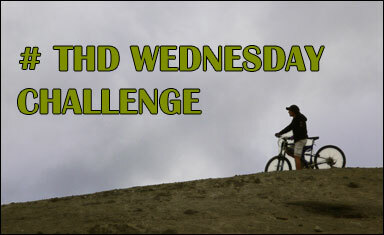 With that in mind, and to help us get back to blogging as well, we’re starting the THD Wednesday Challenge. Each week will be something different. It could be exercise related, it could be food related, or it could be something mental. We have some ideas to get us all started, but we value your suggestions as well. This week’s challenge is squats! We’ll start at 10am and go until 5pm. Each hour you will do the same number of squats as the hour, in military time. So 10am will be 10 squats, 11am will be 11 squats, 12pm will be 12 squats, 1pm (or 13:00) will be 13 squats, etc. Join us and use the Twitter hashtag #THDWednesdayChallenge to let us know how you are doing! Zee (@zeethd) and Suze (@suzethd) will be there! And you can join us on Facebook too! So today was the 4 week mark when I was supposed to get back on the scale and begin counting calories again. As a recap, my plan was to work out 5-6 times a week and eat healthy, but not count calories. I failed on both ends. I can’t say I didn’t pay attention to what I ate, because I’m confident I was fully engaged when I was eating Frito Scoops with french onion soup dip. I was also fully aware when I was mixing up mojitos, mint juleps, and Lynchburg lemonades. But I slacked. I wasn’t accountable for my calories so I cheated. I should’ve known it wouldn’t work because that is precisely how I tried and failed to lose weight in the past.